Located directly on the sparkling Caribbean Sea, Azure Breeze is one of 6 separate villas situated in North Side, Grand Cayman. This newly decorated beachside villa has breathtaking panoramic ocean and beach front views from both the ground floor living area, as well as from the expansive oceanfront master bedroom and adjoining balcony. 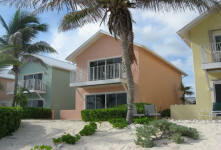 It is literally just a few steps from your double sliding back door to the soft, expansive sandy beach and miles of crystal clear waters teeming with healthy shallow coral reefs and an abundance of underwater marine life. There is a private courtyard and entry, as well as outside dining on your oceanfront patio. The villa can comfortably sleep 6 people. Grand Cayman is an upscale, tax free, stable and safe island with the friendliest residents in the Caribbean. There is an excellent choice of casual oceanfront restaurants within a few minutes from the villa. These include The Lighthouse Restaurant, The Wreck Bar at Rum Point, the Kaibo Beach Bar, Over The Edge and Portofino's. For scuba divers, Grand Cayman offers world class wall and reef dives with several beach entry dives in the area. Other activities include touring the Queen Elizabeth II Botanical Gardens, hiking and bird watching on the Mastic Trail, the Blowholes, Underwater Submarine tours, the Turtle Farm, Hell, and Duty Free shopping in George Town. So much to do and more! !